By Ronney McKee Staff Writer. 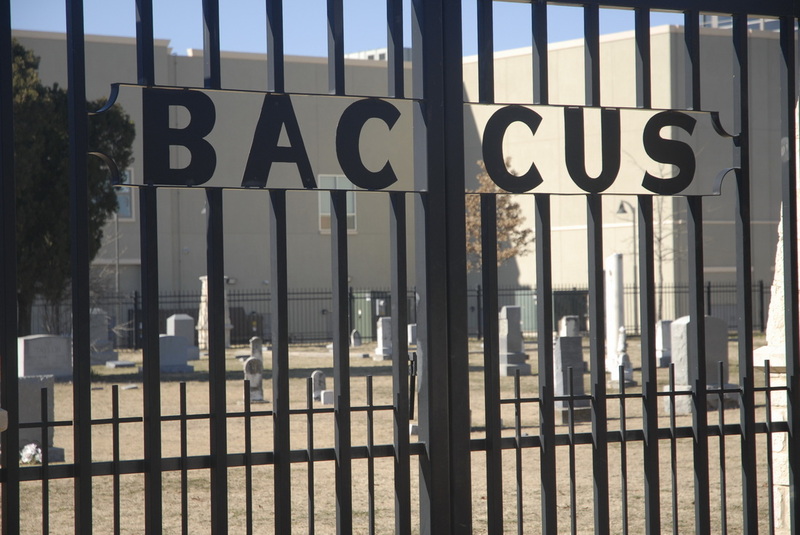 Amid the rapid development of Legacy Office Park is a piece of Collin County history, known as Baccus Cemetery. Situated five miles south of Frisco and one mile south of State Highway 121, on Bishop at Legacy, the cemetery is a part of a farm homestead built in 1845 by Lt. Henry Cook (1775 - 1865), a veteran of the War of 1812. Cook moved from Illinois to what was then known as Peter's Colony. In 1847, Cook needed a cemetery in which to bury his son, Daniel, who was born in 1831, so he set aside a section of his 640-acre farm as a cemetery. Today, Daniel Cook's grave is believed to be the oldest marked grave in Collin County, said Frisco resident Charles Pearson, a Great-great-grandson of Henry Cook. The cemetery took the name Baccus after one of Cook's daughters, Rachel Cook Baccus, inherited the portion of land containing the Cemetery. In 1878, she deeded the land to the heirs of Henry Cook for church and cemetery purposes. The cemetery was named Baccus Cemetery around 1915 in honor of Rachel Baccus' gift. The cemetery was granted historical landmark status in 1980. The marker indicates the Baccus Christian Church sanctuary was constructed on land adjoining the cemetery around 1908, but was disbanded in the 1930's. Pearson said the church was situated on the south side of the cemetery, where Legacy Drive is now situated, just north of Electronic Data Systems Corp.
Today, the cemetery is maintained by an association that operates on gifts from family and friends. A tour through the well-manicured cemetery reveals names prominent in Plano and Peter's Colony history. Many of the people buried there are descendants of Henry Cook. The names include: Cook, Baccus, Heustis, Martin, Dudley, Bishop, Pearson, and Miller. In 1979, when Pearson buried his daughter, Libby Louise Pearson, the land surrounding the Baccus Cemetery was still farmland. But soon, Dallas businessman H. Ross Perot began purchasing the land to develop it into Legacy Office Park, home of Electronic Data Systems Corp., Frito Lay Inc., Southland Life Insurance Co. and the future headquarters for J. C. Penney Co. Inc.
Burials still take place at the small cemetery. Probably the most recent burial was that of 95-year-old Lena Bishop Pearson, Charles Pearson's mother, who died in January. It won't be the last burial at the cemetery, though. Pearson said both he and his wife plan to be buried there. With all the land development surrounding it and all the corporations moving in, Pearson is proud of this family's legacy, which remains alive in the history recorded on grave markers throughout the Baccus Cemetery.